Ingredients: Cannabidiol (CBD), Ursolic Acid, Myricetin, Panthenol and Tetrahydrocurcumin. Purchasing this product will earn you 85 Greenbucks! Application: Apply Aczedol topically to problem areas of the skin 2 – 3 times daily. 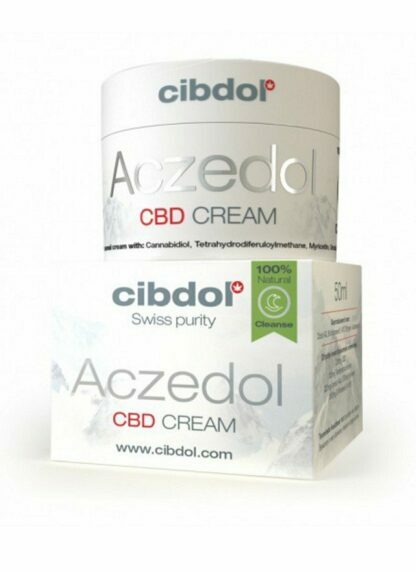 Cibdol Aczedol CBD Cream for Acne is a brand new CBD Skincare product that has been released by Cibdol, one of the best known and trusted CBD producers in Europe. This new CBD natural cosmetic product harnesses the nurturing ability of CBD to help combat the symptoms of acne. Aczedol’s unique formula targets explicitly the Acne Vulgaris causing bacteria secreted from sebaceous glands and features the power of liposomes, which allow CBD’s restorative and antibacterial functions to penetrate deep into the skin, where it is needed most. The Aczedol product contains the active ingredients CBD, Ursolic Acid, Myricetin, Panthenol and Tetrahydrocurcumin, and this formula is applied to the face as a water-based cleansing cream that encourages anti-inflammatory responses. Inflammation is responsible for causing much of the pain and redness associated with pimples and cysts and relief naturally is always welcomed. Cibdol is one of the foremost manufacturers of high-quality CBD products and the CBD oils and salves that they manufacture represent an array of pure and potent products that maintain their exceptional standards of quality. To ensure that all Cibdol products are produced and processed with customer health and safety in mind, they extensively test their products in their Swiss laboratories. What’s more, they send the products off to third-party agencies to guarantee transparency. Many people struggling with acne suffer the psychological and physical consequences of breakouts, and the Aczedol formula is designed to cleanse the skin fully. At Cibdol, they believe in the power of CBD, and that’s why they continue to release products that highlight the organic efficacy of CBD without the presence of GMO’s, chemical fertilisers and additives. Cibdol CBD Salve – Aczedol. Cannabidiol (CBD), Ursolic Acid, Myricetin, Panthenol and Tetrahydrocurcumin. Apply Aczedol CBD Cream topically to the face by administering a small amount of the salve to problem areas of the skin 2 – 3 times daily. Do not use this product on recently injured or broken skin. Avoid making contact with the eye and under-eye areas, as this may irritate. Despite Acne Vulgaris’ frequency in adolescents, it can affect individuals of all ages in the form of mild to severe outbreaks. Hormonal imbalances causing excessive sebum production proliferate in bacteria Propionibacterium acnes, (P. acnes) stimulating IL-8 – a group of signalling proteins, known as chemokines, which induce inflammatory responses, which is where Aczedol’s powerful cleansing ingredients come into play. In addition to the salve, we recommend an oral formulation with Inositol that acts as an anti-androgen, which helps to mediate human hormones.